Assume you already have a Raspberry Pi configured as a WIFI router like mine shown below, but you live in China and have to deal with the fact that many websites can’t be accessed due to GFW. Don’t be despair and with some hacking you can get your Internet freedom back. The mechanism is to use shadowsocks on your router which directs any traffic to a shadowsocks server in the free world. 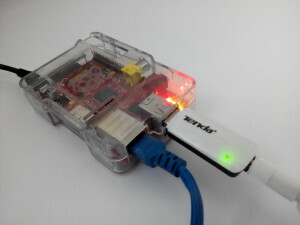 It’s simple to get it up and running on a local machine, but on a router you need to use redsocks to redirect traffic to the shadowsocks client running on your Raspberry Pi. DNS traffic has to be routed by redsocks as well otherwise your DNS replies will be contaminated. To remain as fast as normal when accessing China websites you also need to skip routing traffic to Redsocks for anything within the China IP ranges. Even if you don’t care about performance, this is still necessary in some circumstances like geoip restriction such as tv.sohu.com does not deliver contents if you live outside of China. I assume that you have shadowsocks server running on a public server, so I will skip that part and only talk about the client side. Installing shadowsocks is very simple, note that it will be installed under /usr/local/. But we want traffic from other hosts in your network to be redirected by redsocks to your local shadowsocks client, which in turn sent to the the remote shadowsocks server. We need to pay special attention to DNS traffic, as DNS poisoning is prevalent in China. We need to take special care to redirect DNS traffic through redsocks/shadowsocks. These all can be accomplished by iptables. You need to run the following iptables commands, or put them in a local script and run it with sudo. Run iptables -t nat -L -n to make sure the rules have been added correctly. Now start up redsocks by sudo /etc/init.d/redsocks start and let’s test it out by doing some web browsing on another computer in your local network. If that works fine, congratulations and you have set up everything correctly! If not, look at shadowsocks output and also turn on redsock’s log_debug and check if there is anything useful in /var/log/daemon.log. remote: Counting objects: 815, done. Receiving objects: 100% (815/815), 213.52 KiB | 111 KiB/s, done. Resolving deltas: 100% (426/426), done. www.youtube.com is an alias for youtube-ui.l.google.com. youtube-ui.l.google.com is an alias for youtube-ui-china.l.google.com. If it goes well, run src/chinadns -m -c chnroute.txt when your router boots. That’s it! I hope these are useful to you. Update: I have switched from ChinaDNS to dnsmasq+dnscrypt, please read Securing DNS Traffic in China to see how to set it up.